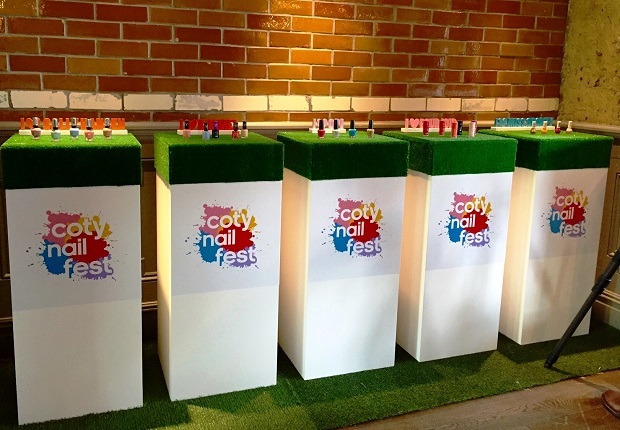 To celebrate Coty’s Nail Day we were asked to help them create a festival vibe to showcase five of their nail varnish brands. 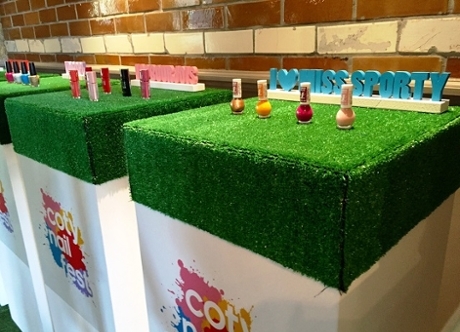 We designed a “Coty Fest” logo especially for the event and matched it to the key spring nail shade for each brand. This was then printed as logo vinyls which were used for branding on product plinths. The room was dressed with a large area of artificial grass, with more grass added to the top of the product displays, along with our miniature wooden phrases which we painted in the key colours. Creating areas for the manicurists to relax we included picnic tables, straw bales covered in branding and pretty food stalls with colourful painted stripes.